Lately I’ve been on an trying to get back into my healthy eating and exercise routine. I haven’t workout again yet but have started with breakfast. I normally would go to McDonald’s and get a Egg McMuffin and orange juice. It even two of them. 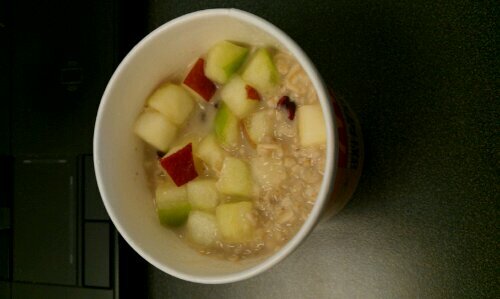 But recently I tried this new Fruit and Maple oatmeal that started offering. I must say it quite good. The small cut pieces of apple took some getting use to, but overall it was good. Now a two dollars I could probably just buy my own oatmeal but this is a phased back to that. Now my morning breakfast consists of the Fruit & Oatmeal from McDonald’s and orange juice from the Snack shop in my work building. Not a bad way to start the day.